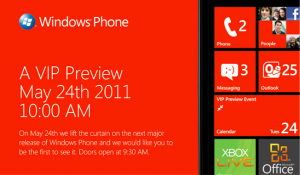 Microsoft is apparently sending out invites for a Windows Phone event on May 24th. We checked our inbox, but no love. The event invite says, “On May 24th we lift the curtain on the next major release of Windows Phone and we would like you to be the first to see it”. The blazing red tiles look similar to what we’ve see on those HTC Trophy press shots, so it certainly sounds like the Verizon launch is coming on the 24th and not on May 12th as rumored., but we are hearing it’s a preview of Mango for analysts and press. We’ll keep checking our inbox and hope to have coverage of the event. Why would they have a “preview” on a day they are launching a phone? This is clearly an event and not a launch set for the 24th.